Jackson Mason has a lot to be angry about in the YA novel Ice Cold. The 18 year old high school student has to come to terms with the fact that his father is coming home after spending 5 years in prison. To add to his problems, his parents decide to move to a new town for a fresh start, meaning Jackson has to start at a new school, one where there aren't many black students. Luckily, he soon catches sight of a pretty girl that helps with the adjustment. Jackson has a hard time forgiving his father. Before his father Lincoln was sent to prison, the family was getting by with both parents working in the construction industry. But then 5 year old daughter Shanice was diagnosed with leukemia. The financial stress of medical appointments and unpaid bills caused Lincoln, in a moment of desperation, to rob a jewelry store. After he was sent to prison, the family fell on seriously hard times. They were homeless for a while, and Jackson had to take on emotional and financial burdens far beyond his years. So it's no wonder that he's not very welcoming when his father comes back into the family home (which also includes a grandparent, his father's father). Lincoln is not too concerned about starting in a new school. Everyone at his old school was aware of what happened to his father. The kids at the school seemed to split into two groups -- those who no longer wanted to associate with a poor convict's kid, and those who were enamored of the "gangster life" that Jackson wanted no part of. His dream is to become a professional hockey player, so he only wants to concentrate on making the team, playing well, and impressing the college scouts. His anger towards his father softens a bit when his grandfather tells him that Lincoln also had hopes of becoming a professional hockey player until multiple head injuries ended his career. On arriving at the new school, he quickly befriends Peanut, a young man who sells peanuts and rides a skateboard around the school (Quirky friend? Check!). Jackson also is instantly smitten with Heather, a strikingly beautiful blonde girl who seems to have an air of sadness and fragility about her. Unfortunately, it turns out she's the girlfriend of Brady, the racist, loutish captain of the hockey team. Still, Jackson and Heather begin talking and soon recognize that they have a lot in common. Although she is outwardly beautiful and confident, Heather is being bullied online by harassing, negative comments about her appearance. It has become so bad that she's developed an eating disorder. Although she and Brady are in a relationship, he is only wrapped up in his own concerns and doesn't notice anything wrong. She's able to confide in Jackson, and he's tells her that, like him, she shouldn't be concerned with what others think and also that she could do better that the uncaring Brady. Although Jackson's parents are an interracial couple, once he begins dating Heather he is confronted by both black and white people who are not happy about their relationship. The book does a good job of tackling problems that young people face today, from dealing with incarcerated parents, to racism and peer pressure to eating disorders. One problem I had with the book was that EVERYONE (teens, parents, coaches, etc.) had the same bad grammar issues ("It don't matter," "I ain't afraid," "He don't like it," "How we gonna know who done it," etc.). While teenagers of course don't speak "the Queen's English" to each other, surely some people would have learned the correct third person use of "do." It also got a little preachy at times, with the saintly Jackson rising above all adversity to stay true to himself and his values. But overall it was an enjoyable book with characters that you care about and hope will succeed. 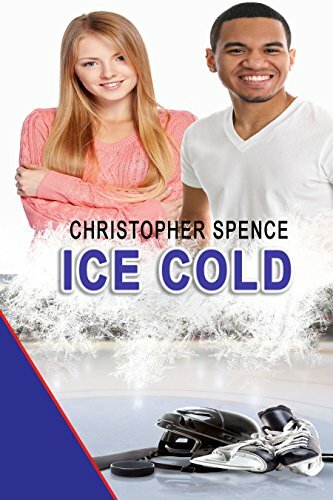 I received a copy of Ice Cold in exchange for this review.